Superbowl Sunday is right around the corner, which there must be wings, finger foods, and party food in general! I personal love tail gating and football parties strictly because of the food. — Hello, my name is Zee and I love to eat. How are you? I’ve made plenty of game-day friendly recipes before but none as easy as these Rum Glazed BBQ Wings. It’s a recipe that you can whip up in an hour especially if you have extra guests who show up for the game. They’re super fun to eat and even better to remix. 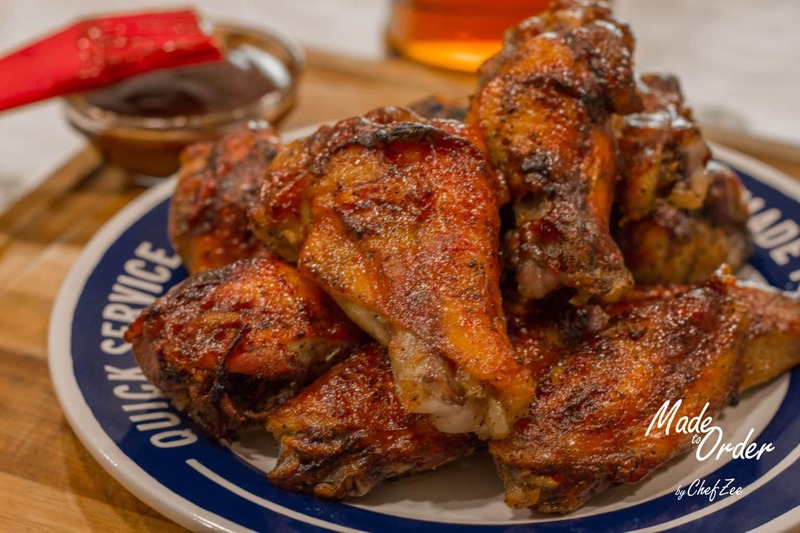 Now I love, love, LOVE Rum which is why I opted for a Rum Glaze but you can definitely choose to make these wings with Bourbon, Whiskey, or no alcohol at all. You can also choose to skip seasoning the chicken altogether but I wouldn’t recommend that. By seasoning the wings just a little bit beforehand, you allow yourself the option of having these wings dry with the BBQ Sauce on the side as a dipping sauce. Not only that, but I’ll also never cosign bland chicken. You’d be surprised what a little garlic and onion can do! Nonetheless, I do hope that you’ll enjoy this recipe that’s perfect for get togethers! If you like to see a step-by-step video on how to make these wings, make sure you check you my YouTube Channel: Made To Order and click: How To Make Rum Glazed BBQ Wings. Once sauce begins to bubble and warm up, turn off and set aside. You want to warm up sauce enough to cook off the alcohol vapors in the rum. You can serve these wings dry with the BBQ sauce on the side as a dipping sauce. I love doing this! You can always omit the rum altogether or substitute it for your favorite Bourbon or Whiskey.